This book examines key moments in the emergence of London as a metropolis and considers different ways in which its image has been formulated and presented. 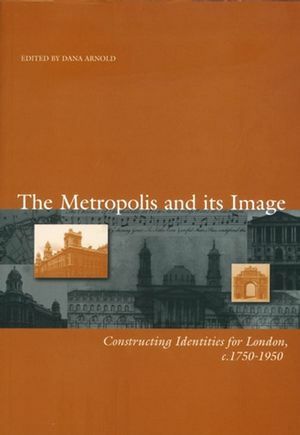 The chapters address a range of topics from specific questions of architectural style to the relationship between the City of London and London as a metropolis, and explore different methods of constructing urban identities. Dana Arnold is Professor of Architectural History at the University of Southampton, and Editor of Art History, the journal of the Association of Art Historians. Until 1999 she was Director of the Centre for Architectural Studies at the University of Leeds. 1. Aestheticizing the Accidental City: Antiquarianism, Topography and the Representation of London in the Long Eighteenth-Century: Lucy Peltz (The Museum of London). 2. Peripheral Visions: Alternative Aspects and Rural Presences in Mid-Eighteenth-Century London: Elizabeth McKellar (Birkbeck College, University of London). 3. 'Beastly Sights': the Treatment of Animals as a Moral Theme in Representations of London c. 1820-1850: Diana Donald (Manchester Metropolitan University). 4. London Bridge and its Symbolic Identity in the Regency Metropolis: The Dialectic of Civic and National Pride: Dana Arnold (University of Southampton). 5. Government and the Metropolitan Image: Ministers, Parliament and the Concept of a Capital City, 1840-1915: Michael Port (Queen Mary and Westfield College, University of London). 6. Rebuilding 'The Heart of the Empire': Bank Headquarters in the City of London, 1919-1939: Iain Black (King's College, London). 7. Benjamin's Paris, Freud's Rome: Whose London? : Adrian Rifkin (Middlesex University).